Now that it’s had its capacity boosted to 765cc, does the new Street Triple RS make enough power to put it on a performance par with its bigger brother, the Speed Triple 1050? Triumph claim the new, bigger-engined Street now produces 121.3bhp, while they say their 1050cc Speed Triple makes a meaty 138bhp. 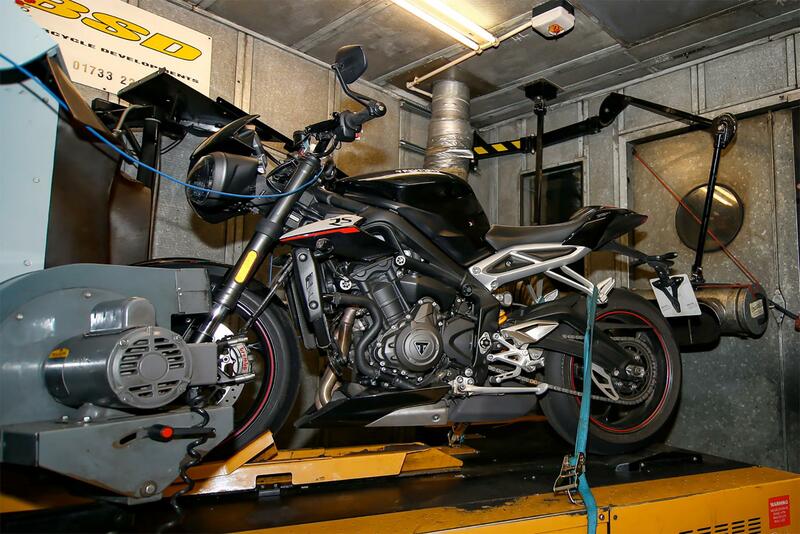 It’s not uncommon to find that manufacturer claims differ from the actual dyno figures that you or I might get from out own bikes. There can be many reasons for this, from crank figures being claimed rather than rear wheel outputs, through to different types of dynes being used or even the weather conditions on the day. But to find out exactly what’s what, I got both bikes on the same dyno, on the same day to find our which naked Triple is boss. 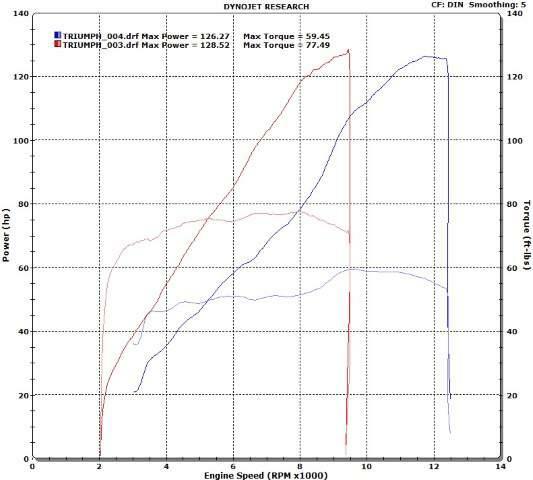 After testing both bikes on MCN’s regular dyno (BSD in Peterborough), to my surprise the new Triumph Street Triple 765 RS made 126.27hp @ 11,750rpm and 59lbft @9500rpm at the rear wheel, which has made me wide-eyed as it’s actually 4hp more than claimed. To put things in to perspective, the 2016 Speed triple made 128.52hp @ 9250rpm and 77.49lbft @8000rpm, which is a bit shy of the claimed figures by Triumph. 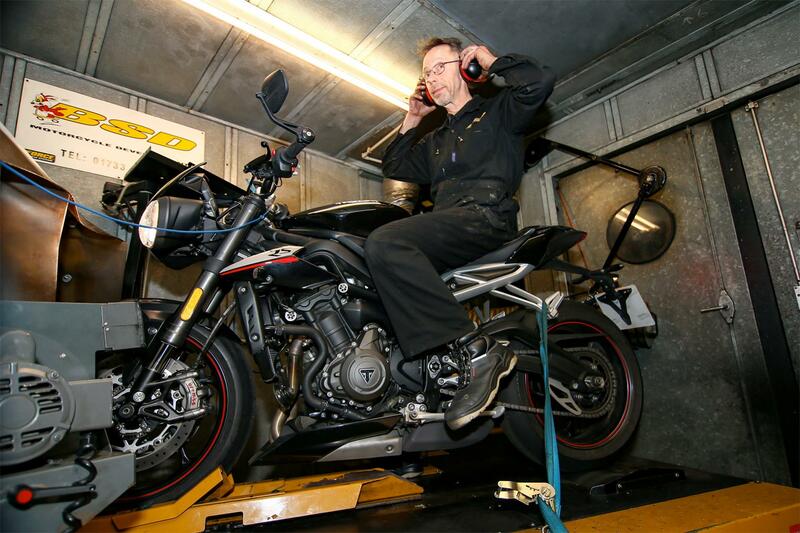 Although the Speed Triple 1050 makes much more torque than the 765cc Street, the peak power gap between the two models has significantly narrowed. Not only that, but when you take into account that the Street Triple RS is £2200 cheaper, 26kg lighter, smaller and more nimble, the Street Triple 765 RS really is a force to be reckoned with. I’m even more please with the bike.